The first annual All Girls Student Athlete Academy Training Camp is set to be held from Monday, February 11 to Friday, February 15. A spokesperson said, “We are proud to announce our first annual All Girls Student Athlete Academy Training Camp. 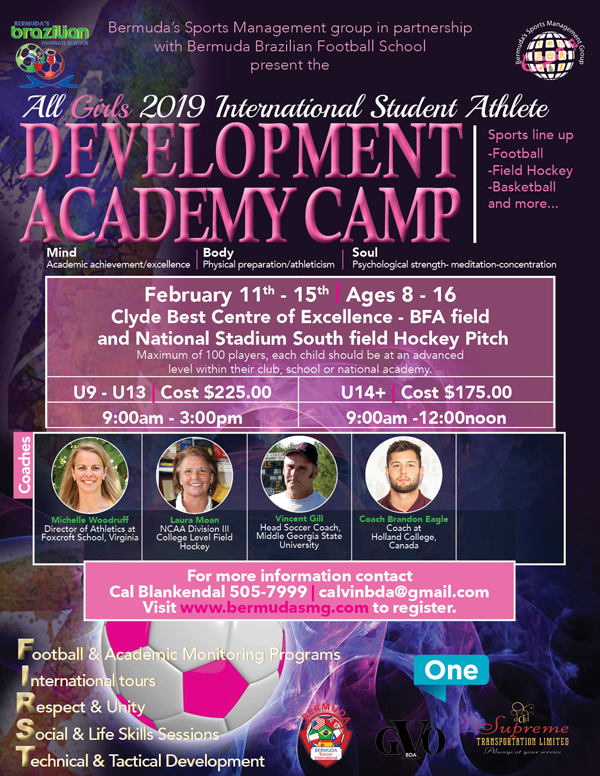 This development camp will offer coaching in the sports of: field hockey, football and we are looking to add basketball to the week long program. “The 5 day camp will provide our female athletes with an on island affordable opportunity to showcase their potential to a group of highly qualified and experienced coaches. Our student athletes will have realistic opportunities to receive overseas training, trials and academic bursaries. “The camp will feature coaches from the USA and Canada who are staff coaches at boarding schools, colleges and external based academies. Thus far, the incoming coaches have networks in Canada, USA and England and are eager to recruit players for their academic institutions. “During the past 8 months we have secured and or aided in 8 student athletes receiving international bursaries, 2 international semi-pro contracts and 1 youth academy club contract in the USA, Canada and Holland. “The camp will be held from February 11th to the 15th from 9:00 am to 3:00 pm for the ages 9-13 and from 9:00 am to 12:00 noon for ages 14+. We wish to encourage each school/club and/or parents to register their outstanding athletes. “The All Girls Student Athlete Camp will focus on talent identification, player development, academics, life-skills and international opportunities. This is an affordable/realistic on island opportunity for a large pool of players to improve and share the wealth of training philosophies/opportunities. Camp registration will open on Friday, January 18th, via www.bermudasmg.com.